Are you at that point in your summer when you are trying to fit in all the things you had planned to do? Excursions to parks, museums, a few big cities, or even just a attraction not far from home that you never get to? I feel that way about getting together with friends as well. The friends that you have been bumping into walking the dog, sporting events, and the grocery store. You always mention that we will get together this summer for a BBQ for sure. Well hate to tell you this, but time is running out. Maybe you haven’t pulled it together because you don’t have time (all those museums). Or you find the idea of cooking for friends a wee bit daunting? Here’s a super easy summer dinner that requires no time at all, also no complicated instructions or ingredients. That way you can spend more time with these friends you never see. It’s always good to start on the coleslaw first, that way it can sit and marinate. 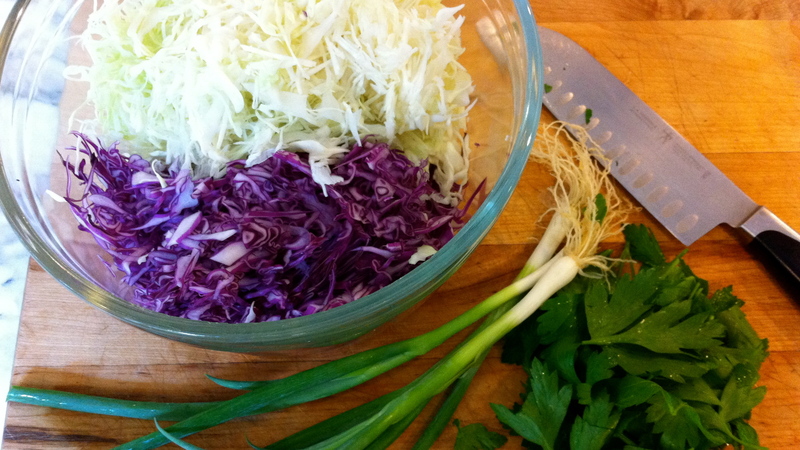 Get a large bowl, add 1/2 head of shredded cabbage (red and green, its pretty that way) either using mandolin or by hand. Finely chop 3-4 green onions, add those too. Then parsley about 1/4 cup also finely chopped. 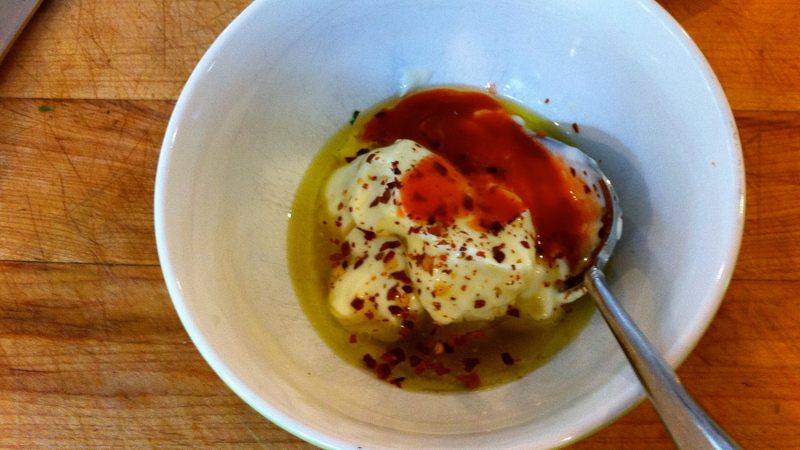 In a small bowl add 1/4 cup mayo, 3 Tbs olive oil, 1/2 tsp hot pepper flakes ,2-3 Tbs hot sauce, 2 Tbs vinegar (apple cider, white wine or red wine) and 2 Tbs sugar. Mix well. 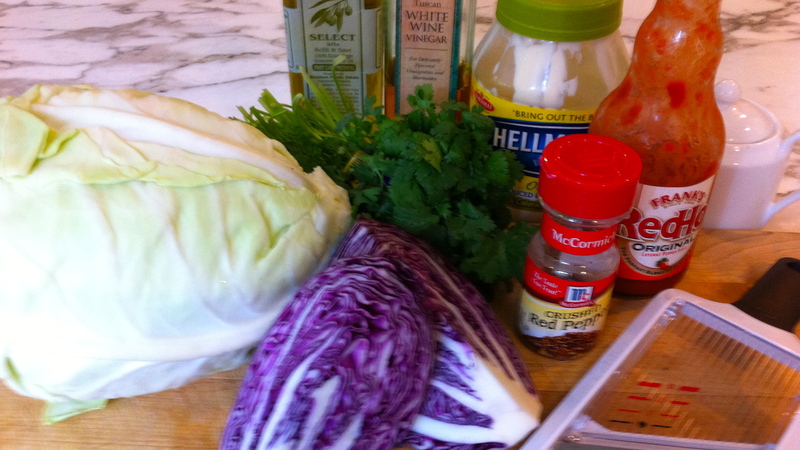 Add to shredded cabbage and mix well. Refrigerate until ready. You can do this early in the day, that way you have more time later for other things. Now grab your shrimp (I served 4 large per person plus 2 scallops), wash and peel them, devein and butterfly (just cut along the “backbone” with a small paring knife about 1/2 through). Set aside. (don’t worry it won’t be that spicy, you can use 1/2 tsp if you prefer) and of course some salt & pepper. Add your shrimp to bowl and toss to coat. Set aside until you are ready to BBQ. If that is hours away you better put them in the fridge. 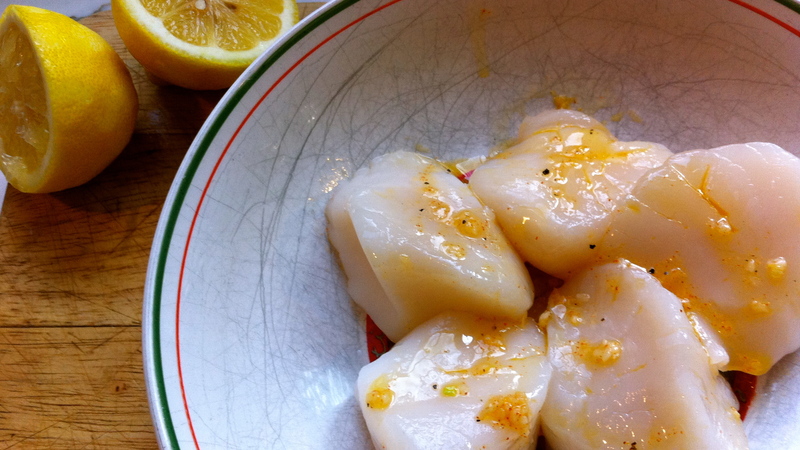 Now do the same with the scallops if you are having them as well. 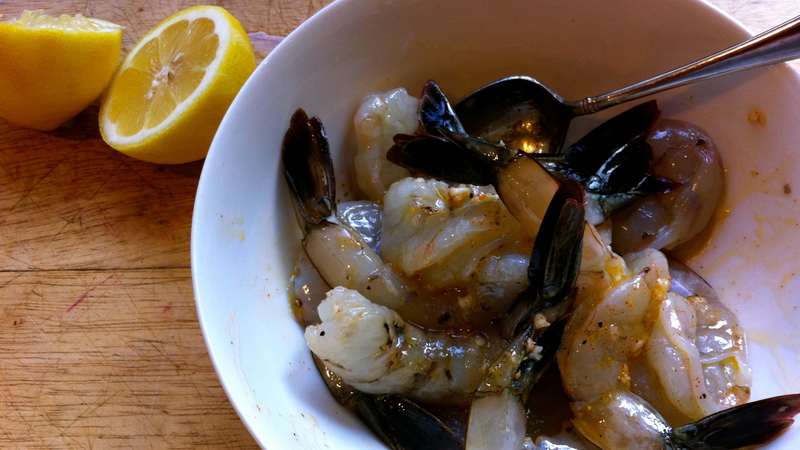 About 5 mins before you are ready to BBQ add the juice of 1 lemon to the seafood. If you add too early they will start to cook and you will have seafood cervices instead. We served a nice tomato/mozzarella salad, some warm baguette and some string beans with this. All can be made in advance and serve room temp when ready to eat. Enjoy, I will be back in a week or two. 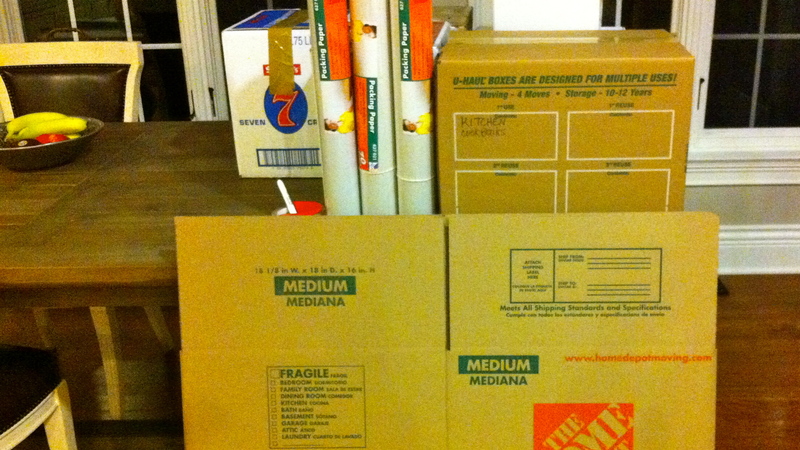 We are moving. Yep, is it ever fun? Your photographs are exceptionally beautiful! I have friends that read cookbooks for inspiration but I’m a visual person and believe the way food is displayed is just as important as it tastes. I’m inspired!!!!! 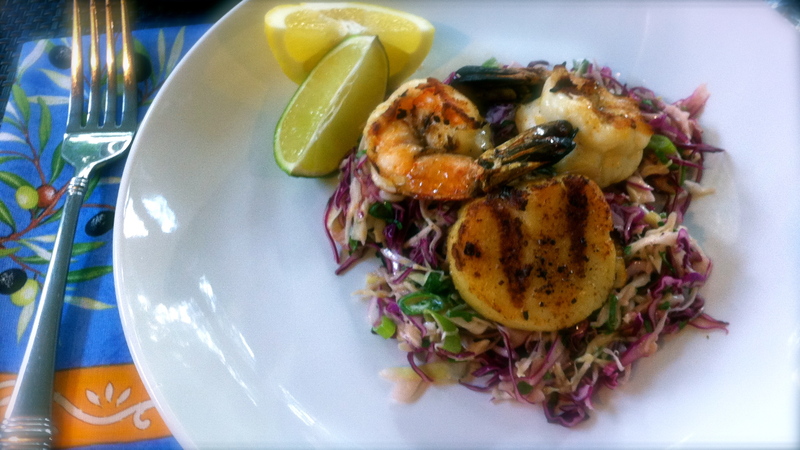 It’s only 8:30am but I can’t wait to get home to make garlic scallops with coleslaw.